David Cameron yesterday echoed his discredited shadow home secretary Chris Grayling in refusing to accept crime was falling. David Cameron yesterday echoed his discredited shadow home secretary Chris Grayling in refusing to accept crime was falling, saying police recorded crime not the British Crime Survey should be the measure – yet failing to accept that the recorded crime figures also showed a fall, down 7 per cent from 2008 to 2009. Recorded violent crime fell 3 per cent in the same period. “The House of Commons library has just done a very good piece of work to show that if you look at actually violence against the person, and we all feel that actually we’ve become more violent and there have been problems with particularly anti-social behaviour and drink related violence, violence against the person has gone up by something like 40% on a consistent basis according to these House of commons figures. An “accurate picture”, however, is something the Conservative Party leadership, and scaremongering Tory candidates, have consistently failed to give. As the graph below illustrates, violent crime, vehicle-related theft and domestic burglary have all fallen steadily since 1997, following their peak under the last Tory government. “Why can’t David Cameron admit what a retired police officer asked him to admit today [yesterday], which is that crime is falling? The statistics watchdog has told his shadow Home Secretary to stop misleading the public but they can’t resist. Two years ago Cameron was prepared to admit that crime was falling, but now we are in an election campaign he has gone back to denying reality. “The British Crime Survey is one of the most reliable surveys of crime in the world, set up by the Tories themselves in the early 1980s. Criticising it by saying it doesn’t include murder is ridiculous – but, for the record, the murder rate is the lowest for a decade. Last week there was further evidence violent crime was down, with accident & emergency admissions for violent incidents – an indicator referred to by Liberal Democrat home affiars spokesman Chris Huhne on the Daily Politics home secretaries debate – down in the last year, showing the same downward trend as the BCS and police recorded crime. Since Labour came to power, violent crime has fallen by 41 per cent. 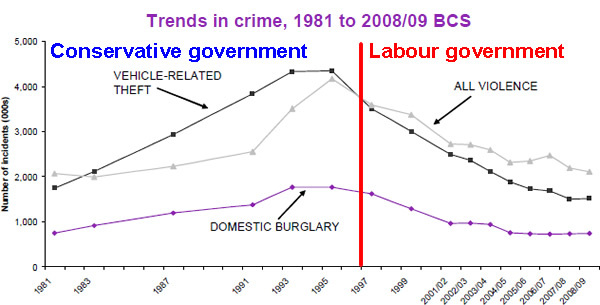 RT @leftfootfwd: Tories still refusing to admit crime is down: http://bit.ly/badmqc < it's getting pathetic now! I only report crimes for insurance purposes these days. Everyone knows full well that the police are going to do nothing in most cases. My own personal highlight was when the police turned up 3 days after I was burgled and the first thing they told me after they walked in was “there is no way we can solve this”. They stuck to this line even after I pointed out to them that “I had seen the burglars faces and could identify them”. It would be interesting to see a similar graph that showed peoples confidence in the effectiveness of our police over the same time period. Any evidence available? 1. How many crimes have you personally been affected by that you didn’t report “for insurance purposes”? I’d be prepared the bet the answer is “none”. 2. Let’s imagine you had been a victim of crime, and you were so upset by the Labour party that you hadn’t bothered to report it. If the British Crime Survey rang you up, would you lie to them? If crime is really going up the only way the BCS and recorded crime stats would be down is if people weren’t reporting and were lying to surveyors. So I think we can probably say that crime is down. 2. Lap-top stolen from pub. Had to report for workplace insurance. (This is another fabulous case study of police not bothering to investigate despite having loads of video evidence of the gang that keep stealing lap-tops from the same pub). JQP in Brief « The view across the bar. Seriously though, you think your anecdotal evidence is more reliable than a crime survey taking in 1000s of people? Cam I also ask why you seem to take pleasure in the fact that the country has got worst (which I dispute) just because it happened on the watch of people you don’t like? What is so enticing about this miserable mindset? So why do the Tories put out a leaflet in my area saying crime is DOWN? Presumably so they can tell everyone what a great job their council is doing. No – I am saying that I suspect that peoples confidence in the police has plummeted and that lots of crimes are not reported / recorded anywhere. I’d like to see a graph of peoples relative confidence in the police alongside those statistics. Why would I take pleasure in the country getting worse? It certainly doesn’t help my 70 year old neighbours who came home just last night, to find that their garage door handle had been snapped off. He keeps a Harley Davidson, turns out there has been a spate of Harley thefts in our recently…. So crime is not down.